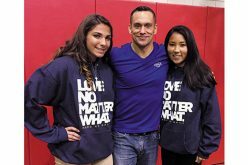 A contingent from Paul VI High School, Haddonfield, was in Rome for the canonization of their school’s patron. 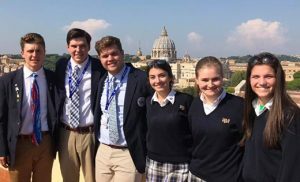 At right are some of the students from the class of 2019 who made the trip: Dan Schmidt, Jack Jablonoski, Gavin Petersen, Sabrina Colclough, Juliana Sweeney and Olivia Darley. 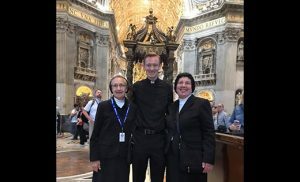 Below, Sister Mary Ann Gecina, teacher, and Sister Marianne McCann, principal, catch up with Peter Gallagher, class of 2012, who is currently attending the Pontifical North American College in Rome, Italy, in preparation for his ordination.